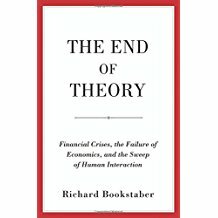 I am the author of The End of Theory (2017, Princeton University Press), which critiques the applicability of economics in dealing with financial crises, and proposes an alternative paradigm using agent-based models. 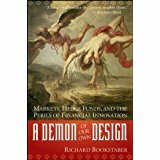 I am also the author of A Demon Of Our Own Design (2007), a book highlighting the fragility of the financial system that occurs from tight coupling and complexity. The book is noted for its foreshadowing of the financial crisis of 2007–08. Why the blog title, This Is the End? 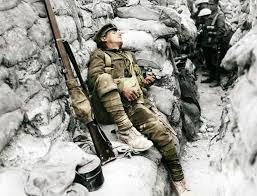 Because most of my career has been in risk management, and it is thus in my nature to be looking at the downside of the markets, and that sometimes bleeds out into the world in general. 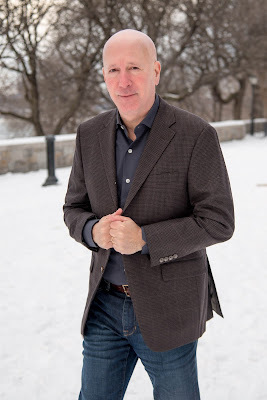 I have worked in risk management with chief risk officer roles on both the buy-side at Moore Capital and Bridgewater, and on the sell-side at Morgan Stanley and Salomon, and from 2009 to 2015 I served in the public sector at the SEC and the U.S. Treasury, drafting the Volcker Rule, building out the risk management structure for the Financial Stability Oversight Council, and developing an agent-based model to assess financial vulnerabilities. These roles have put me at the center of some of the critical crises of the last three decades – working with portfolio insurance during the 1987 Crash while at Morgan Stanley, overseeing risk at Salomon during the 1998 failure of Long-Term Capital Management (dubbed “Salomon North”), and with the aftermath of the 2008 Crisis while in the regulatory sphere. Currently, I am the Chief Risk Office for the Office of the CIO at the University of California, overseeing their $120 billion pension and endowment portfolios. In this role I am continuing to apply agent-based models for risk management. I received a Ph.D. in economics from MIT. I live in New York, making frequent trips out to California for my work. As you will detect from my posts under Sports, I spend a lot of my free time with Brazilian Jiu Jitsu. I am also working on a book that looks at the rise and fall of civilizations through the lens of complexity.